(CBS/AP) PASADENA, Calif. - Dutifully executing its complex flight control software, the Mars Science Laboratory silently raced toward its target Sunday, picking up speed as it closed in for a 13,200-mph plunge into the Red Planet's atmosphere and an action-packed seven-minute descent required a rocket-powered "sky crane" to lower the one-ton nuclear-powered rover to the surface. It went off without a hitch. 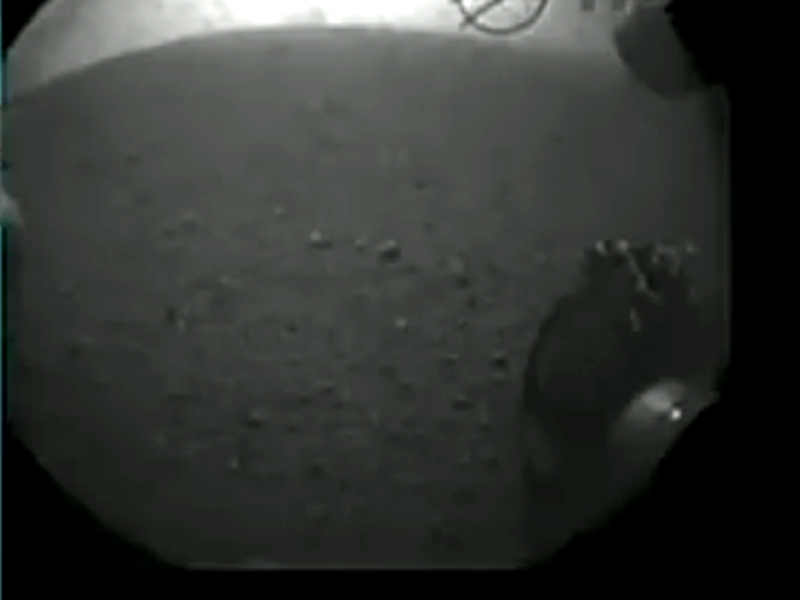 "We are wheels-down on Mars," came the news from NASA's Jet Propulsion Laboratory (JPL) as engineers saw the first grainy image beamed directly back from the rover - showing one of its wheels on the Martian surface. CBS News space consultant William Harwood reports from JPL in California that the rover's target was Gale Crater and the goal was a pinpoint landing near the base of a three-mile-high mound of layered rock that represents hundreds of thousands to tens of millions of years of Martian history, a frozen record of the planet's changing environment and evolution. Exploring the crater floor and climbing Mount Sharp over the next two years, the Curiosity rover will look for signs of past or present habitability and search for carbon compounds, the building blocks of life as it is known on Earth, explains Harwood. But first, the rover had to get there and its entry, descent, and landing represented the most challenging robotic descent to the surface of another world ever attempted, a tightly choreographed sequence of autonomously executed events with little margin for error. With just 90 seconds to expected entry into the Martian atmosphere, engineers at JPL reported all data showing a flawless descent. The massive parachute deployed correctly, leading to cheers from the control room. But the room erupted into unbridled joy as confirmation came - first in the form of simple data signals, and then with the first photo showing that the rover had safely settled into the Martian dust. Even Holdren's boss chimed in. In a statement released minutes after the successful landing was confirmed, President Obama said it represented, "an unprecedented feat of technology that will stand as a point of national pride far into the future." Mr. Obama said the Curiosity landing, "parallels our major steps forward towards a vision for a new partnership with American companies to send American astronauts into space on American spacecraft. That partnership will save taxpayer dollars while allowing NASA to do what it has always done best - push the very boundaries of human knowledge. And tonight's success reminds us that our preeminence - not just in space, but here on Earth - depends on continuing to invest wisely in the innovation, technology, and basic research that has always made our economy the envy of the world."